I’m putting together a list of great films that feature food as a theme. 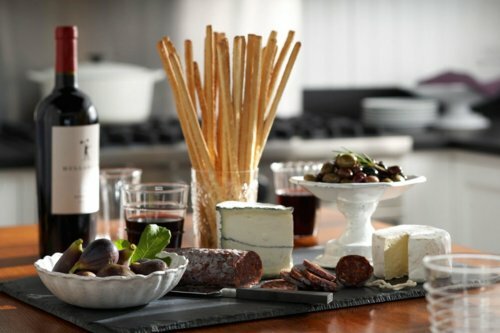 Pick a bottle of wine from the cellar, prepare a great meal and sit back and enjoy ! Who’s Killing the Great Chefs of Europe ? 1. Preheat oven to 400 degrees F. Heat a skillet on medium-high heat. Add the bacon and cook for 4-5 minutes, so that it’s still flexible. Meanwhile, cut two circles out of each slice of bread. 2. Spray a muffin tin with cooking spray. Lay the slices of bread into the bottom of each cup. 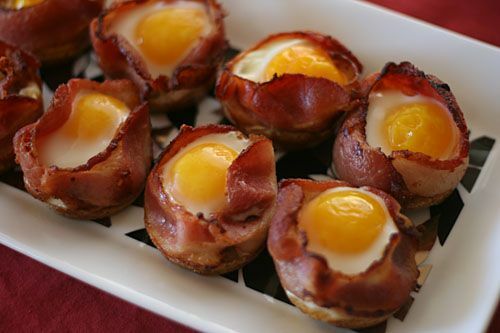 Wrap the bacon around the edge of each muffin cup. Sprinkle cheddar cheese on top of the bread slices. Crack the eggs, one at a time, into a shallow bowl and pour carefully into each muffin cup. 3. Bake for 10-15 minutes until the whites have set and the yolk is to your desired consistency. 4. Present to your tired and hungry fiance. Cook extra bacon. Eat extra bacon. Enjoy. Worry about your waist later. 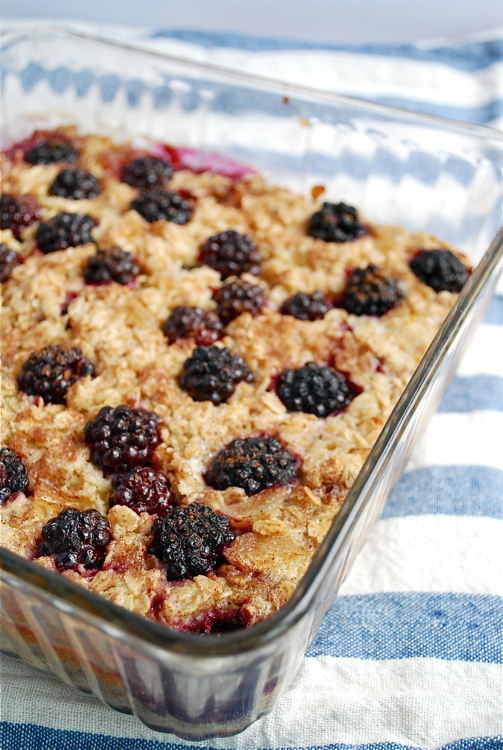 Because you can bake and reheat as needed, baked oatmeal is a great optional for a satisfying weekday breakfast. If the weather ever cooperates, this is the ideal way to jump start a busy fall day. Preheat the oven to 375 degrees. Butter an 8” square baking dish. In a large bowl, combine the 9-grain cereal, sugar, ginger, baking powder, spices, and salt. Slice the bananas into the prepared baking dish so that they cover the bottom. Cover bananas with a third of the berries. Spoon in the oat mixture, and then pour in the milk mixture. Press the remaining berries into the oats, and sprinkle top with cinnamon. Bake for 35 – 45 minutes, until the mixture is bubbling vigorously and the edges are lightly browned. Remove from oven and cool for 10 minutes. Slice up and serve with a sprinkle of fresh berries. Thaw the puff pastry dough according to the package instructions. Preheat an oven to 425°F. Lightly grease a baking sheet. On lightly floured surface, roll out the puff pastry to 1/4-inch thickness and cut into a 10-by-8-inch rectangle. Place the pastry on the prepared baking sheet. Using a paring knife, score a border 1/2 inch in from the edge of the pastry. Using a fork, prick the center of the pastry. Brush the border with the egg wash and refrigerate for 15 minutes. In a small bowl, stir together the crème fraîche and cheese, and season with salt and pepper. Spread the crème fraîche mixture on the pastry, keeping the border clean. Lay the bacon on top, slightly overlapping the slices. Bake the tart for 14 minutes, rotating the baking sheet halfway through baking. Remove the baking sheet from the oven and place it on a level heatproof surface. Using a fork, prick any large air pockets in the pastry. Crack the eggs onto the tart, spacing them 2 inches apart. Bake until the egg whites are set and the yolks are still soft, 7 to 10 minutes. Transfer the tart to a platter, garnish with the chives and serve immediately. Fruits and vegetables don’t always live up to our expectations — there’s nothing more disappointing than bringing home an avocado to satisfy your intense guac craving and realizing it’s not ripe enough to mash up. Or finding the perfectly colored plum and biting into it expecting sweet deliciousness but instead getting harsh bitterness instead. We think you deserve the very best, so we’re arming you with all the information you need to get just that. Since you can’t taste-test your produce before you buy it, sometimes you need to use four of your five senses to discern whether or not it’s fresh and at the perfect stage of ripeness to meet your expectations. Use this guide to choose the best of the best next time you’re at the grocery or farmers market. If you’re looking for an apple to bite into or slice up for a salad, you’ll want a ripe (but not too ripe) one. It should be firm (no soft spots), brightly colored, with smooth skin and no wrinkles. The rounder ones sometimes pack more flavor. If you’re planning on making an apple pie or using the fruit for some other type of baking, look for an apple that’s just past the ripe stage and a bit mushy. There are different varieties of avocados that come in different shapes and sizes, so don’t use size or shape to determine quality. Ripe avocados should have a little give when you press gently on the skin. Avoid overly mushy and rock-hard ones. If it’s slightly too firm, give it a day or two at home to ripen. While brown spots and discoloration may indicate poor quality in some fruits, the brown flecks on bananas don’t. Choose plump, firm (but not hard) bananas that are yellow or yellow with brown flecks. If they’re slightly green, they’re not quite ripe — let them rest for a day or two at home. Bell peppers should be firm, glossy and smooth with no wrinkles. Whether you’re buying green, yellow, red or orange, the color should be bright, and the pepper should feel heavy for its size. A good way to test the freshness of blueberries is to give the container a gentle shake. If the berries remain in place, they’ve probably seen better days. Fresh, ripe blueberries are completely blue, firm and dry. Avoid watery blueberries or blueberries with leaking containers. Look for broccoli that’s tightly backed and feels heavy for its size. The greener, the better — avoid broccoli that has started to yellow. The stalks should be firm, and the bunch shouldn’t look dried out. Choose deeply colored carrots — preferably ones that still have brightly colored greens attached. They should be firm with smooth skin and no wilted greens, blemishes or cracks. Choosing the best cauliflower is a lot like choosing the best broccoli. You’re going to look for tightly packed bunches that feel heavy for their size. The greens should look fresh — no wilted, yellow or dry greens. Avoid bunches with brown or soft spots. A fresh bunch of celery is tight and compact with crisp stems and bright green leaves that aren’t wilted. Avoid bunches that have brown spots on the stalks. A good way to test a celery bunch is the scratch-and-sniff test: Scrape a bit of one of the stalks with your nail and smell. If it smells sweet, you’ve found a winner. If it smells bitter, go fish. Many people recommend pulling off the husks to inspect the corn for freshness and quality. A less troublesome (and more considerate) way of testing corn is to inspect what you can see and feel with the husks on. The tassels should be brown and sticky to the touch, not black or dry. The kernels underneath the husks should feel plump, and the husks should be green, not yellowed or dry. The best cucumbers are firm, dark green, with smooth skin and no wrinkles, blemishes or soft spots. Buy the unwaxed varieties, like English or hothouse cucumbers, so you can eat the skin, a good source of vitamin A. Check out the eggplant’s skin: It should have no blemishes or soft spots, and it should bounce back after applying some pressure to it with your finger. It should also feel heavy for its size. Grapefruit should feel firm — avoid any with soft or soggy spots near the stem end. The skin should be yellow, sometimes with a pink tint, and it should feel heavy for its size. No matter what color you’re buying, grapes should be deeply colored and plump with crisp stems. If they seem wrinkled or leaky, look for a better bunch. Rely on your eyes to pick the best kale. The leaves should be thick and crisp, not wilted or soft. Look for deep green bunches with no yellowing, and avoid kale with holes in the leaves, an indicator of insect damage. The smaller-sized leaves often have a milder taste. Test the kiwi the same way you would test an avocado. Apply some gentle pressure to its flesh; if it has a little give, it’s ready. If it’s really firm and doesn’t budge, it needs more time to ripen. Kiwis should be plump, with smooth, tight skin. Avoid any with wrinkles, soft spots or bruises. The color should be consistently light green-brown, and it should smell citrusy. Look for firm, crisp, brightly colored leaves. Don’t buy bunches with brown ends, wilted greens or slimy areas. Choose the uncut kind for longer-lasting lettuce. You’ll want to inspect the shape, color, firmness and smell for the best mangoes. Color is sometimes, but not always, indicative of quality. Choose mangoes that are plump and round (as opposed to flat), that have a little give when you apply pressure to the flesh. Don’t worry about brown spots, but avoid mangoes that look wrinkly. The stem end should give off a sweet and fruity smell. Fresh mushrooms are unblemished and firm, with an earthy smell. Don’t buy them if they look slimy. Go for the whole ones, rather than the precut packages, if you want them to last as long as possible. Choose onions that are firm and dry with tight, intact skin. Avoid onions that have exposed areas, soft spots, mold or green sprouts. To learn about what type of onion — e.g., yellow, red or sweet — to use for different types of dishes, click here. Oranges should be firm, with no blemishes or shriveled spots, and heavy for their size. They should smell sweet. Choose navels for eating and Valencias for juicing. Peaches are notoriously difficult to gauge when it comes to quality and taste. Check out the color, shape, firmness, smell and the quality of its skin. The sweetest ones have an almost-gold background color; avoid ones that are green. Choose plump peaches that yield slightly to pressure and smell sweet around the stem. Avoid the ones with bruises, wrinkles or discoloration. Choose plums that are of medium firmness — not too hard and not too soft. They should have a little give when you gently apply pressure with your thumb. A chalky white powder is OK; shriveled skin, bruising and soft spots are not. Spaghetti squash should feel heavy for its size. The yellower, the better — avoid any with white or green hues. The skin should be firm, with no soft spots, cracks or blemishes. Look for dull-looking, not glossy, squash. Shape doesn’t matter when it comes to strawberries, but color, smell and firmness do. They should be deep red — the more intense the color, the more antioxidants — and should feel firm and dry and smell sweet. Keep an eye out for mold. The freshest, best-tasting tomatoes are plump and firm (should yield to a little pressure), deeply colored and glossy. The skin should be free of soft spots, wrinkles and cracks. They should feel heavy for their size and smell sweet. Buy the ones on the vine for the freshest, best taste. Zucchini should be firm, brightly colored and free of cuts. Choose small- to medium-sized zucchini that are less than 8 inches long for the best taste. It has been said that ‘You have to break some eggs to make an omelette,’ but I prefer ‘ You can’t unscramble an egg.’ Either way, the egg is either broke and ready or awaiting it’s full ‘ova-potential.’ In this blog, I’ll recount the 100 (or more) way to prepare an egg. The traditional chef toque is often thought to represent the 100 ways to prepare an egg, but no definitive list exists to recount these 100 ways. In the coming posts, I’ll search for the newest, the most traditional, and the most unusual ways to use this simple, essential and delicious food.